During my first trip to Hungary a million or so years ago, I visited an amazing little town called Szentendre. It’s an interesting combination of Mediterranean and Central European architecture. Cobblestone streets, old buildings, pleasant people and lots of places to shop flood my mind when I think of this town. I love to shop. The place overflows with beautiful crystal, gorgeous Hungarian embroidery . 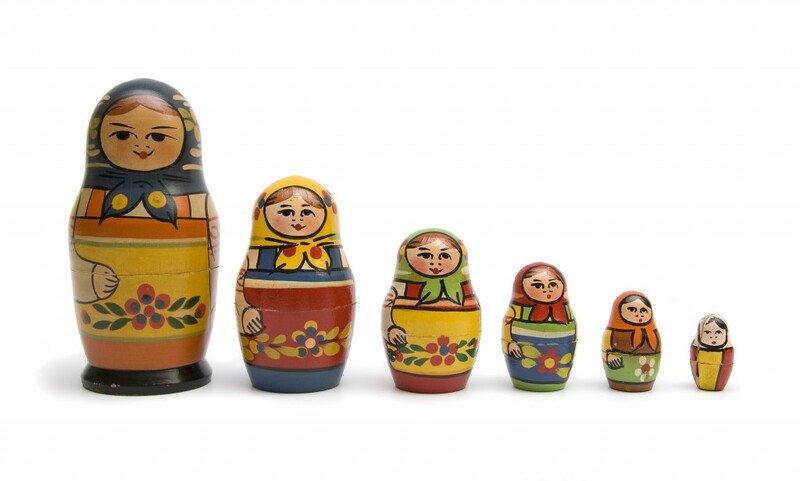 . . and matryoshka, Russian nesting dolls. The dolls were a surprise to me. I associated them with Russia not Hungary. When I first noticed them, I saw the traditional dolls with their rosy cheeks, head scarves, and colorful skirts. As I began to look more closely I realized there were many non-traditional versions. Michael Jackson in all his skin colors and nose shapes were stacked within each other–the lightest skin and pointiest nose on the outside to the innermost Jackson 5 looking version. There was a set consisting of the last five or six U. S. Presidents. World leaders comprised another set–it really helped to know who most of them were. The Russian and British royal families each had their own sets, and there were some nativity sets with Kings, Shepherds, Joseph, Mary, and Jesus all nestled together. If I were to paint the dolls to represent my faith walk, I wouldn’t use a nativity scene. I’m not sure what all the layers would be; perhaps a church would be on the outside, and then my pastor, and then perhaps some biblical teachers and writers I read from time to time, and ministry. The Bible would be close to the center. I’d probably have a representation of my journal somewhere along the line, but at the center would be Jesus. While Jesus is at the core of my walk, there are a lot of layers to peel off to get to him. I get distracted by those layers. I fall into the trap of thinking church is enough. My pastor’s preaching can easily take the place of my own Bible reading and study. Devotionals and books about the Bible and Jesus? Oh! They’re good and I learn from them. I get distracted by the outer layers. There are times when I don’t get to the inner parts. Sometimes I let others do the work for me and live off their gleanings. I know I can go for a while and miss out on Jesus completely. Other times I just don’t have the energy to do anything and miss him again. The longer I live, the more I know I want the inner part. I want Jesus. While there is so much good in the outer parts–so much!–I don’t mean to disparage them at all, they’re about Jesus, but they’re not him. This fall I started an on-line discipleship course with about 20 of the kids I work with. While the online interaction with them has lacked–we’re all still figuring it out–the strength of the program has been the way it forces me to regular Bible reading and journaling about what I’m reading. I love the accountability I have with the kids and my small group leaders. While none of them chastised me when I fell weeks behind, I know they can see what I’m doing. For me, that’s powerful. Yes, I’m relying on external motivation. Yes, I’m following a plan. However, when I look at anyone else’s thoughts it’s only for clarification not to let them tell me what to think. I’m reading, and writing, and unwrapping more of Jesus than I have in a while. I’m getting to the center of the nest. How do you unwrap Jesus? What helps you? What hinders you? Once again I’m blogging with Faith Barista Bonnie at the Thursday Faith Jam here. After you leave a comment, hop over there and see what she and others have to say. This is beautifully written, Soul. I agree with you 100%. It’s pretty rare that I get down to that heart-to-heart level. There are too many distractions. I have to say I would love to have more of the distractions that you mention. There aren’t too many small groups and Bible studies around–besides the one I’m leading. I was overwhelmed the other day by the thought that I’m actually daring to lead this Bible study with these lovely ladies, when my own spiritual walk is so sporatic and, frankly, shallow. I got a taste of the awesomeness of my responsibility and how lightly I had been taking it… I think I need more accountability. Not sure what that should look like. James and I are aware we would like to pray together the two of us more often. That really helps. But I need more heart-to-heart times with my Center. Let’s pray for each other in this.